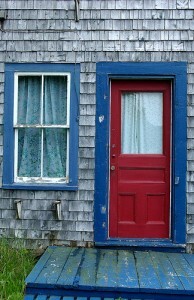 As well as lobster, there are some weathered and characterful buildings in Halls Harbour. Halls Harbour, a tiny village north of Kentville in the Annapolis Valley, is one of the best places in Nova Scotia to see the world’s highest tides at work. At high tide the fishing boats bob in the harbour and just six hours later over 13 meters of water recedes, leaving the boats to sit on the mud flats, waiting for the water to return. It’s an amazing to witness and there’s plenty more to explore in Hall’s Harbour aside from the tides. Lobster lunches, fresh off the fishing boats and cooked beside the wharf, are not to be missed. You can work off your lunch with a stroll on the walking trail that starts from the back of the harbour. It takes you through old pine forests and fields to a view over the Bay of Fundy. Watch for some of the dozens of different bird species that live in the area. With one eye on the tides, you can also meander along the beach and pick up some seashells for your collection. Art studios and craft shops offer another opportunity for souvenir hunting, while museum lovers will want to explore the Fish House Museum, detailing the history of the harbour and the area. Directions: Halls Harbour is 16km north of Kentville on Route 359.